I hauled a few things from CFTKR recently as I wanted another 24W hot plate for my mum and I also was interested in picking up a few of the new leave-shaped fall scents. As always the shipping was lightning fast (within a day) and Carol included 6 samples which is so generous! I requested non-spicy fall/holiday scents and everything I got smells awesome! 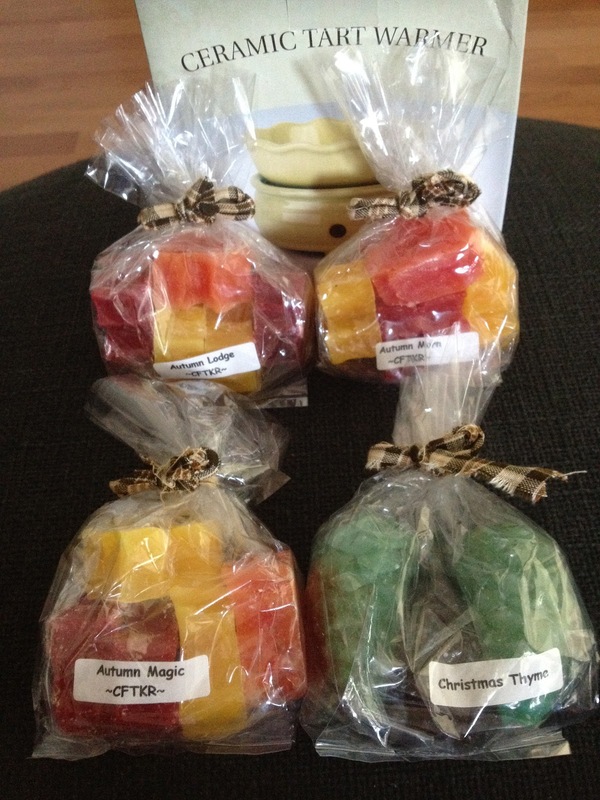 I got 4 oz bags of Autumn Magic, Autumn Morn, Autumn Lodge and Christmas Thyme. The first three are leave-shaped and Christmas Thyme comes in a pinecone shape. -Autumn Magic: Autumn comes to life in this magical fragrance. Autumn magic starts with top notes of lemon and apple; followed by middle notes of anise, cinnamon, and ginger; sitting on well-rounded base notes of woods, musk, and vanilla. -Autumn Morn: A cheerful fall welcome with the spicy warmth of autumn leaves, cinnamon apples, nutmeg and clove. -Christmas Thyme: The aroma of bayberries and apples with a base note of fresh pine needles and thyme, with a top note of freshly ground cinnamon bark.